Ireland, My Island. 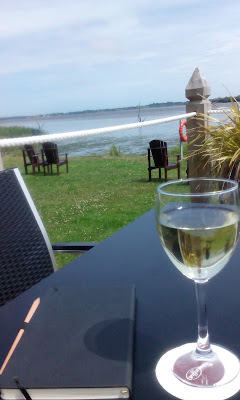 : A lunchtime treat - Dry Dock Bar, Ferrycarrig Hotel. A lunchtime treat - Dry Dock Bar, Ferrycarrig Hotel. Ferrycarrig Hotel is one of the most well-known family hotels in County Wexford. It is set on the banks of the River Slaney and boasts beautiful views of the river just before it reaches Wexford town and on out to sea. I recently popped in to the Dry Dock Bar to have a late, relaxing lunch and do a bit of writing. I dined in the Dry Dock bar and as the Sunny South East was living up to its name I sat outside. The sun was shining and the views really are fab! 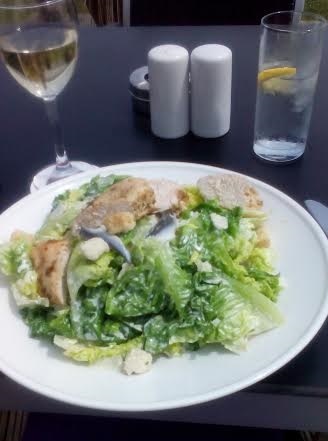 I enjoyed a chicken caesar salad and a glass of pinot grigio. The salad was huge and there was lots of beautifully grilled chicken. A lunch favourite done well. The bill came to €19. The service was prompt and friendly and the salad was enough for two! The other dining option in Ferrycarrig is Reeds Restaurant. I dined there with family a few weeks ago and I would highly recommend it for a fine dining experience without the huge price tag. A short little read this evening! Do comment if you have enjoyed a lunch there recently.